The Wayne County Veterans Memorial is a living monument erected to honor veterans who sacrificed their lives in the line of duty. The site includes a Memorial Wall, Pavilion, Seymour Johnson Air Force Base Veterans Memorial, Wayne County Vietnam War Memorial, Wayne County Granite Map, Fountain and Illuminated Flags. The emphasis on the design is formal yet inviting enough to welcome visitors. The main entrance is located on E Walnut Street. The Memorial Wall is right on the left. Five bronze plaques recovered from the 2004 fire list veterans names. The Memorial Wall is a free standing brick wall, approximately 4½ long X 42¾ wide. The bricks are bull nosed on top and additional bricks are used for a base equal to its width. The Pavilion is right on the right. It is designed to be the site axis that radiates outward in all directions. The Pavilion replicates prominent features of the Wayne County Court House across the street. It has the same round Doric-style columns with Scamozzi capitals, dentil and cornice detail and roof tiles as the Court House. The Pavilion features (20) of Chadsworth’s pre-finished, textured Classic Stone columns. Column size is 14" x 12'. At the end of this brick walk, you see the Goldsboro Jaycees’ 1974 granite Vietnam War Memorial now relocated to this site. There is a fountain with its cascading water in front of the Pavilion. The memorial marker is located on the north side of the site. It has seals of the 5 military branches on top and the inscription is beneath this which reads: "We must honor those sons of ours who fought so bravely. A Grateful Citizen (1925)"
Right behind the Pavilion, there a granite map of Wayne County as it appeared in 1925, the year when the Community Building was dedicated. This map is divided into the twelve townships and shows town names, railroads, rivers, and highways as they appeared then. Within each township there are plaques listing the names of those war dead who have been identified with the township. Three flags - the American flag, the North Carolina flag, and the POW-MIA flag - are right at the intersection of E Walnut and N William Streets. Flags are illuminated and fly day and night. The flag wall incorporates the Community Building's cornerstone bearing the date 1924. Fifth Plaque, far right: Wayne County Memorial / Community Building / 1919 / May-June / Committee appointed by / commissioners of county, by / aldermen and Chamber of / Commerce of Goldsboro to / consider a memorial to the / sons of Wayne who served and / died in the World War. / Committee recommended / erection of a community building / to be both a memorial and / a means of service to the living. / August / Report approved by / above named bodies and committee / authorized to proceed with / undertaking. / October / Campaign begun for funds / to erect building. / 81,000 dollars finally raised. / 1924 / January / Contract for building awarded. / February / 23rd / Corner stone laid / civic organizations participating. 1925 / June 26th / Dedication. In 1919, citizens throughout Wayne County North Carolina joined to honor the local military who lost their lives in World War I. This was accomplished by public subscription, with gifts coming from all townships in Wayne County. The Wayne County Memorial Community Building was dedicated on June 26, 1925. It was a large brick building with white pillars and a lot of windows. The building included a public room with bathrooms, a reading room, a gymnasium, a swimming pool and shower rooms for both men and women, a game room, a bowling alley, a lunch room, and a kitchen. The building had a long and productive life. For many years it housed the American Red Cross, the Community Chest, the Boy Scouts, the Girl Scouts, the Boys Club and the Bureau of Social Services. The American Legion and its Auxiliary had headquarters and their meetings there. In May of 2004, the Wayne County Memorial Community Building burned down due to a fire that is assumed to have been caused by an electrical plug. Only the memorial plaques, now installed on the wall at the Wayne County Veterans Memorial, survived. The memorial complex is located at the intersection of E Walnut and N William Streets, across from the Wayne County Courthouse building. The Wayne County Memorial Marker is closer to N William Street, the Memorial Wall is located on E Walnut Street. Two walkways from both streets lead to the Pavilion. The Seymour Johnson Air Force Base Veterans Memorial and Wayne County Vietnam War Memorial are part of the complex. The WWI Doughboy Statue and John Lawson memorial are across East Walnut street, in front of the Wayne County Courthouse at 224 East Walnut Street, Goldsboro, NC. A bronze plaque commemorating the 75th anniversary of the First Pentecostal Holiness Church is attached to the left support column of the courthouse building. There are over fifty varieties of plants and trees on the site. The 1925 Community Building was located on the corner of Walnut Street in Goldsboro, NC. The 1925 Historic Community Building housed events very similar to those conducted at modern day YMCAs. It also served as a meeting place for town organizations and community activities. Veterans and Memorial Day services are held at the Veterans Memorial. The park is also available for rent for private functions. The intent is for the site to be actively used for veterans' activities, community events, concerts, and visits by community groups, thus continuing its role as a living memorial. 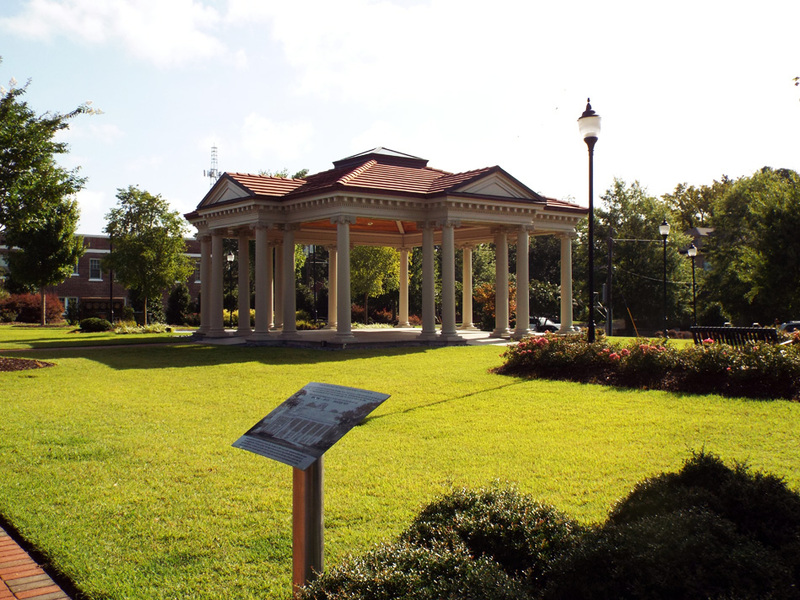 The construction of 1925 Community Building was approved and adopted by Wayne County’s Board of Commissioners, Goldsboro’s Board of Aldermen, and the Goldsboro Chamber of Commerce, and the National Bureau of Memorial Buildings. <br><br>At a public meeting held in January, 2009, many veterans and other citizens expressed the opinion that this “hallowed ground” should continue being a memorial as it was originally intended. 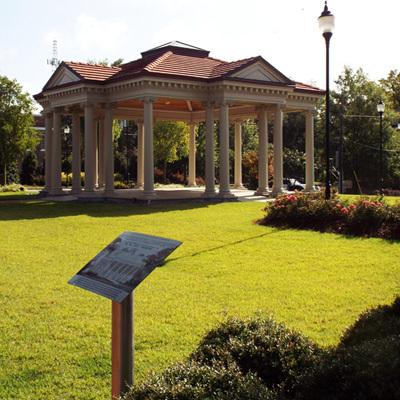 Later that year, after lengthy thought and study, the Trustees launched the Wayne County Veterans Memorial project in Goldsboro, NC. Insurance proceeds from the destruction of the Community Building were used to bring this new project into reality without involving any tax funds.